“Le jeu de la plume a chapeau” a name supposedly fiven by locals in reference to the feather on the valet de treffles helmet. There will be two versions of this pack; one with stencils and pigments consistent with the xylograph, and one representing fragments from Florence. original xylograph reference dated 1584-1597 and signed by Jehan Papin of Lyons. sheet is 19 x 28 cm. One of many patterns with origins in the Lyons region. This pattern was likely around decades before Jehan. I often use “cheater” stencils on packs, making a cut out with lots of shapes to paint my packs. This pack will feature all stencils that would go with a french pack, played out as the reference xylograph has been. 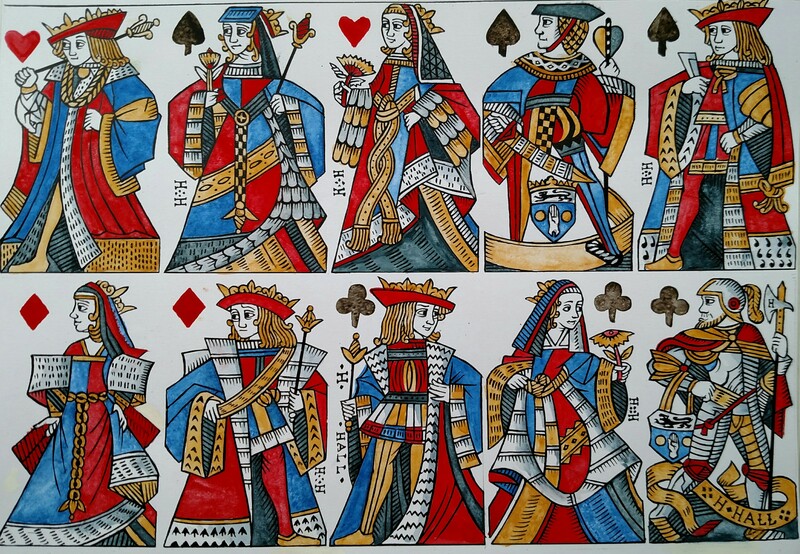 Sheets for the red and black pip cards are needed, as well as Yellow, silver, green, and purple sheets for court cards. 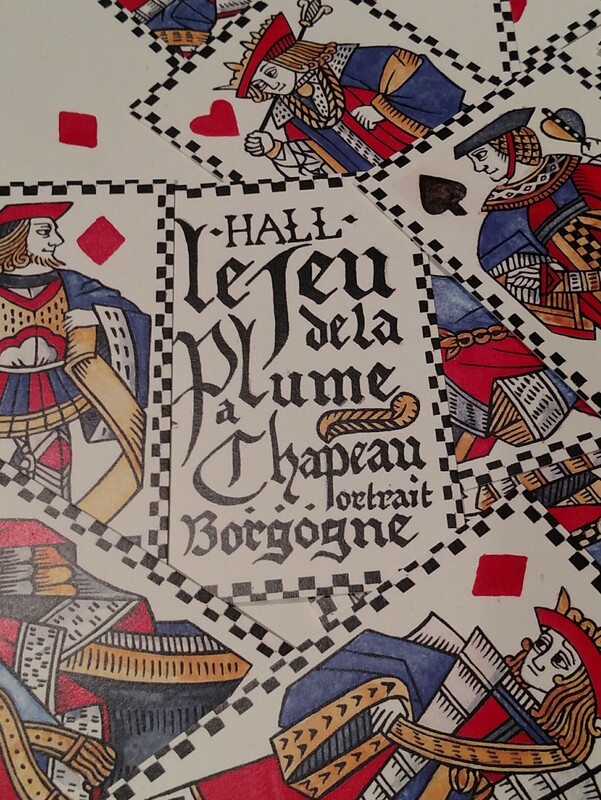 Burgundy pattern court cards sans red valets, as Lyons patterns typically were. Palette is Florentine. Stencils were often cut from sheet metal, hard leather, stiff card, etc. As my sheets will not be producing hundreds of copies, and I wish to avoid injury, I will be using lighter material. Since it is by hope to use as much care and authenticity as possible with this pattern, it will take some time, and I have no eta yet. 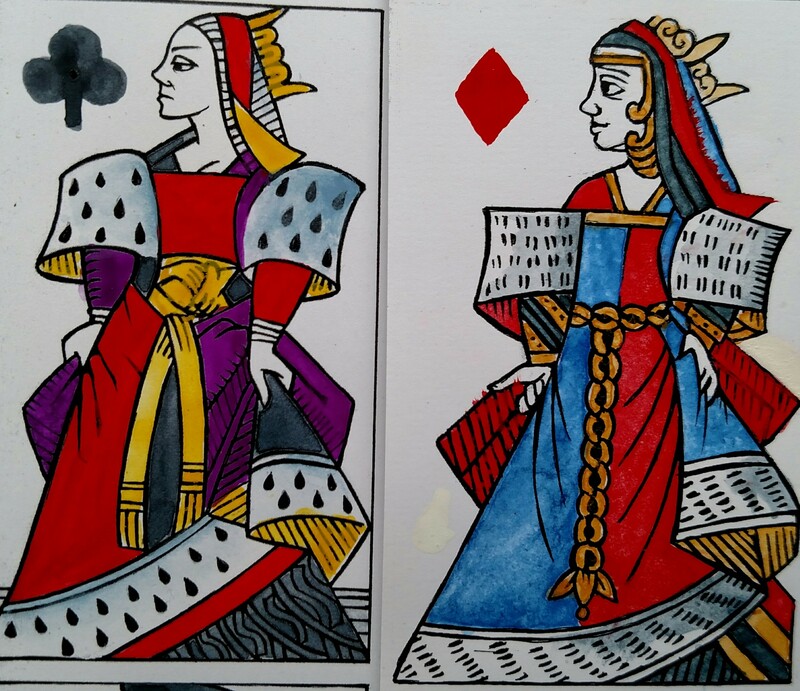 Since the Florentine pack is anachronistic (I have no evidence of it prior to 1630, and I’m using an earlier xylograph), I produced a cheater stencil version for patrons who want French suited cards with backs.